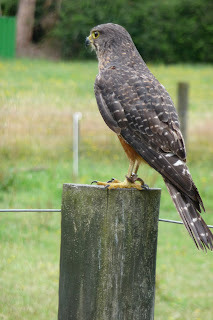 Last week was my birthday so to celebrate mum and I went to Rotorua for lunch and then on to Wingspan Birds of Prey trust. Wingspan care for sick, injured and orphaned raptors. These beautiful birds need our help to ensure there survival. We got to meet two beautiful falcons. Ozzy is trained to chase and hold on to prey using this lure. He wont let it go until he has eaten all the meat attached to it. I was lucky enough to hold Ruby. This is the latest edition to Wingspan. An 8 day old falcon. He weighed just 22g when he emerged from the nest. Yummy! Boy can this little guy eat! A beautiful Australian barn own he has been given a home after losing a wing. A little morepork owl. We often hear these owls call at night so it was great to see one up close. Ohhh cute...looks like you had a great time. 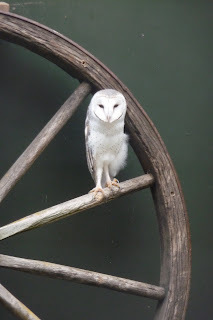 I did not know they had those Aussie Barn Owls in NZ. Happy Birthday.